This photos is an out-take from an upcoming article in a Harris Publications magazine. 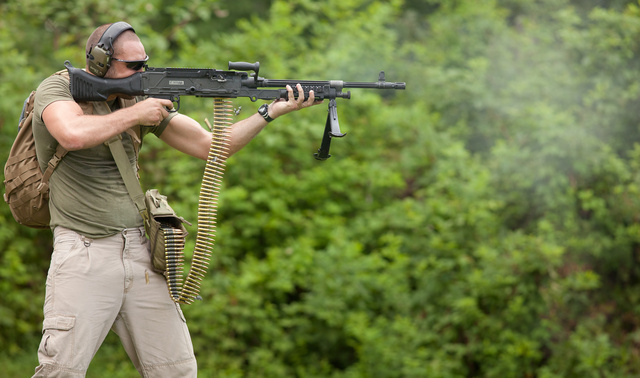 The machine gun shown is about 5 pounds lighter than the regular M240 thanks to the billet machined receiver and a fluted barrel. This entry was posted in weapon and tagged 308Win, belt-red, machine gun, man, strong. Bookmark the permalink. Good looking picture. That said, the elbow moving up into “chicken-wing” stance introduces a lot of instability in an automatic weapon discharge scenario. It’s physics in action. We all tend to go into the bladed rifleman stance when firing a long arm. Not a big deal for a single shot! But when you are going full auto, there are rotational forces that come into play from the recoil that become amplified from the repetition. We all know that most auto’s want to climb. Many of us can and do effectively compensate for this. When you let your elbow come up, though, you effectively weaken one side of the stance (the chicken wing side). Fire enough in rapid succession and you will find your torso rotating around the upright axis, away from the chicken wing. Now your body is fighting recoil induced muzzle climb AND recoil induced rotation. Unless this guy is super strong and super concentrating, he’s likely got too much going on to overcome. I can assure you that it is not comfortable for most folks for a very long time. Until they start seeing the much better results! So… When can we get all the crap repealed so us normal people can get to play with one of those? Do want, so do want. Nice. I lugged one of those around for awhile when they were first issued to the Army back in the late 90’s. Glad to hear they have reduced some weight, the original model was a beast! Heavier than a M-60! What ammo bag is the carrying?